Every Saturday, at the end of our little street, is a “farmer’s market”. The street is shut down and filled with little stalls of veggies, odds and ends, flowers and what not. We’ve started getting into the habit of walking down to the flowers section and buying flowers for our room. 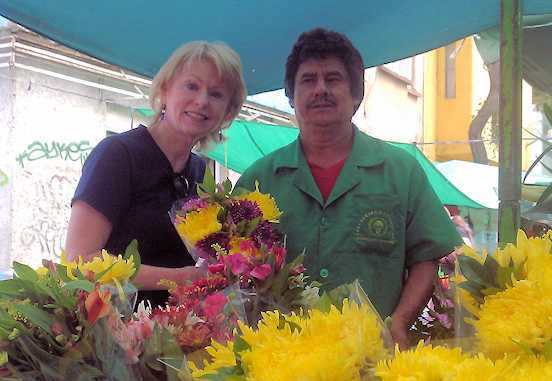 All sorts of fresh flowers are available and a bundle costs 15 pesos. 13 pesos equals $1, so it’s inexpensive and fresh flowers in the room are nice. 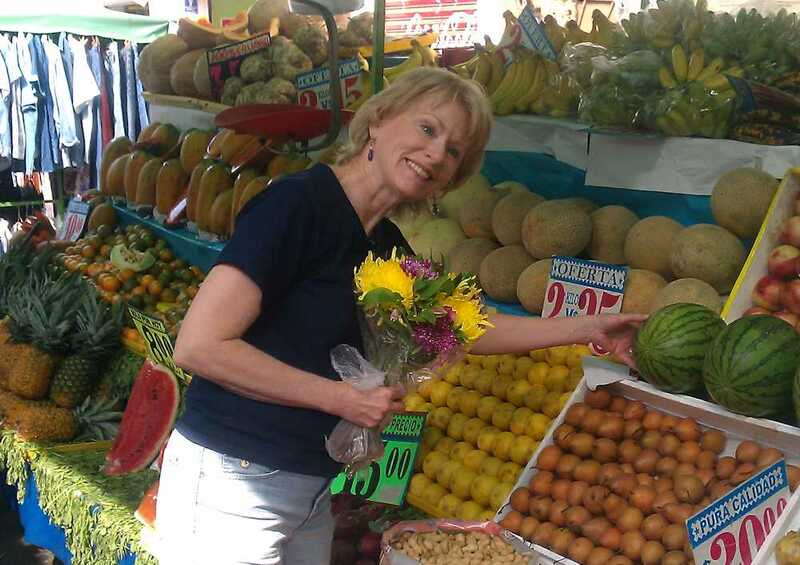 I also love seeing all the fresh fruit and veggies. But the problem for us is that we have a shared kitchen and there’s no place to store stuff. 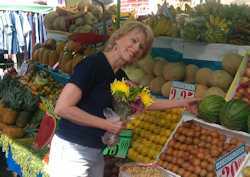 For example, I’d love to buy a pineapple, cantelope, etc, but there’d be no place to store all the extra fruit after one meal. There’s just not enough room in the refrig. And I’d hate to waste that extra fruit, so for now, we just walk around and enjoy the sight! Yesterday, September 15, is a big day in Mexico. It’s not Independence Day (like our 4th of July) because that’s today. The morning started out with a fiesta (party) in our español class. Profesor Andres put on a great spread of tostadas and other goodies for the class. Because of my pick pocket incident Friday night, I was accompanied to a special police station by my good friends from the restaurante. Long before my incident, they had told me they were impressed by this office, the manner in which they’d been treated, and the most important fact – the officer spoke excellent English. They were correct – I too was impressed with how professionally I was treated. It was efficient – more than what I expected. It wasn’t long before I had copies of my police report in hand. 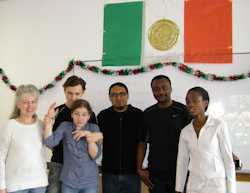 I hustled back to the class at the Casa and found everyone still there enjoying the fiesta. But I knew that the members of that class were vulnerable in their new country and I wanted to show them my new police report and how well I’d just been treated. This picture represents 4 different countries. But how do I communicate with people that only know Russian or French? So I sat in the middle of those two, typed my English into one side while Russian showed up on the other side and after that person read it, I simply clicked the French tab for the other individual. Worked great! But the night of the 15th is a big deal for Mexico. 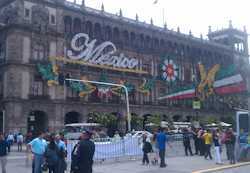 Without going into the history of why – which is a great story – the President of Mexico at 11 pm goes out onto a balcony overlooking the Zocalo, rings a bell and issues great cries for the heroes of Mexico (“el grito de independencia”) to which the crowd yells back “Viva Mexico”! I had wanted to go into that huge crowd at the Zocalo, but my pick pocket incident was too fresh yet, so we just went up the street and watched a smaller, but still big, celebration with a big fireworks display afterward. Today (Tuesday) is the true day of independence from Spain and as I was sitting at my desk this morning I was amazed to see several formations of fighters, helicopters and a formation of 15 trainers fly overhead. Loved it! Our friends at the restuarante were shocked just as we were. Unfortunately, a number of months earlier they’d been victims of a robbery so there was a common understanding between us. I joked and said I couldn’t pay for our meal – but I could wash dishes! Back at the Casa I immediately started the process of contacting our bank, credit card company, etc. Prior to coming to Mexico, I specifically requested my MasterCard have a chip – uncommon in the states, but it gives an extra layer of protection down here. I had a 6 digit PIN for my ATM card (the key is – I thought it was just an ATM card and not also a debit card), so I was quite sure it was secure – wrong! When I went online to the MasterCard account, everything was still fine so I Skype’d our credit card company, told them the issue and they immediately closed the account. We’ll get a new account with new chip embedded cards within a week or so. But our Bank of America checking account had been sucked dry in less than 2 hours. Huh – how could they figure out my 6 digit ATM PIN number so fast? It turns out, as I found out later, the thieves didn’t take cash from an ATM machine. They used the card as a simple debit card and ran it down to an empty tank. I’ve always considered myself knowledgeable about financial matters. That’s why I insisted on a chip MasterCard before coming to Mexico. But I always thought my ATM card was just that – cash from a machine taken from my checking account and not a debit card. Nothing more, nothing less. A fraud person at the bank explained that when the ATM card has a Visa/MasterCard logo on it, it can be used as a debit card and the checking account runs until empty. She acknowledged that that fact greatly increases the risk factor of what happened to us. But now I know that my new future ATM card is – in essence – cash. I’ll no longer carry it around as I did before but only when I know I’ll need it for an ATM withdrawal. I was a pick-pocket victim Friday night. In hindsight, I should have known better. Friday had been a good day for us. We now had 7 weeks of Spanish class under our belts with a good beginning foundation of grammar, sustantivos (nouns), verbos and the like. But we now needed to start speaking and getting the words out. So that afternoon we made our first trip across town to a small language school run by Jose and Teresa who would now start teaching us how to speak. Teresa, an accomplished and excellent teacher, met one-on-one with us for about an hour and a half, helping us take our first baby steps into speech. We skipped the first 2 buses because they were jammed. 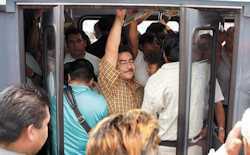 But when we decided to catch the next one, we were caught in a tight vise of people and and found we were shoved, crammed and jammed tightly into the bus. It’s the hardest I’d ever been jammed into a bus. Leslie looked down at her purse and was alarmed to see the zipper was open – it was obvious someone had tried to get in. I immediately put my hand into my front pocket and yes, my wallet had seconds ago been stolen. 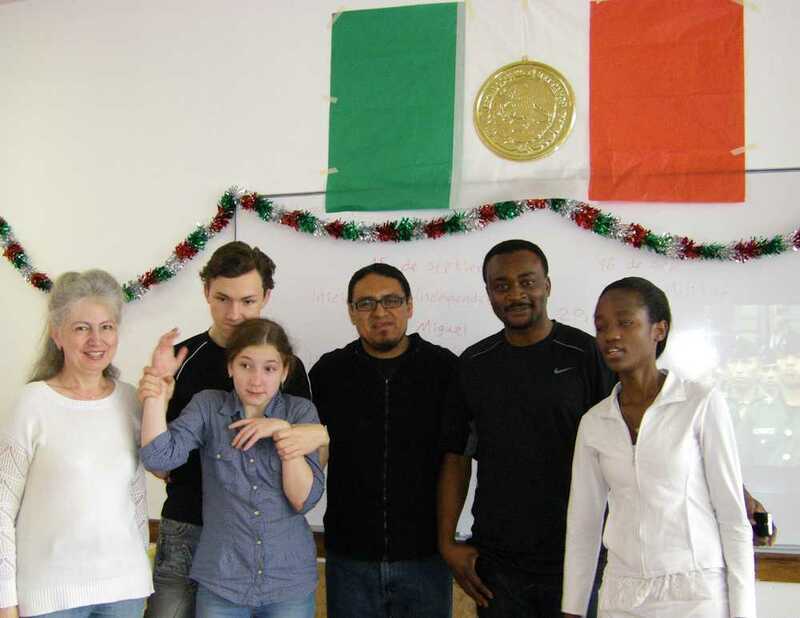 Last Friday in español class, Profesor Andrés taught on Mexican culture. Each of the regions in Mexico have their own foods and ceremonial dress. 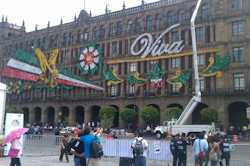 But our assignment for the weekend was to visit the Zocalo where a large “street fair” was underway. Street fair is the best way I know how to describe what we found when we took the Metro over to the Zocalo (huge plaza in the City). Huge tents had been erected and filled with vendors from all over the country. All manner of handicrafts, foods – you name it and somebody was selling it. A large stage was set up for a concert that evening. Leslie saw beautiful embroidered cloth that would make great Christmas presents – but we didn’t have any cash! We just thought we’d be looking around at cultural exhibits. So off to the ATM machine! 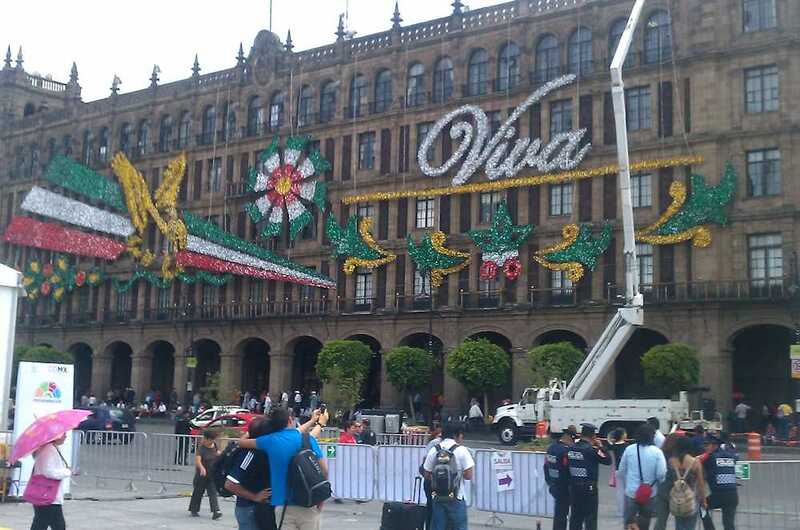 But what I noticed were the “Viva Mexico” signs going up on the government buildings in anticipation of Mexico’s celebration of their independence from Spain. Independence day is September 16, but the night of September 15 is when many people come out to celebrate the cry of Father Hidalgo for independence and revolt. We’ll be learning more in class this week! You are currently browsing the Don Nelson Team blog archives for September, 2014.